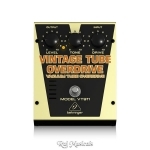 With the VINTAGE TUBE OVERDRIVE VT911 effects pedal, you get distortion with the distinctive tonal quality that only a real tube can deliver, bringing vintage sound back to life. Get a whole tube amp in a pedal and take off with anything from warm blues overdrive to heavy distortion! Virtually all of the most-desired distortion tones can be found in the VINTAGE TUBE OVERDRIVE VT911 pedal. This high-quality classic tube overdrive is based on a hand-selected 12AX7 vacuum tube and offers dedicated Drive, Tone and Level controls for awesome sound shaping. A status LED for effect On/Off is included, plus there is a true hard-wire bypass for ultimate signal integrity. VT911’s dedicated power supply comes with it, so you’re ready to rock right-out-of-the-box!